The ensemble was born in January 2008. Each of the members has contributed with their diverse experiences and musical skills to cultivating a more profound interest in various historical and geographical musical contexts which has resulted in the development of a polyphonic repertoire, both sacred and secular, made up of original compositions, reinterpretations, harmonisations, and arrangements that embrace the elaborate artistic compositions of the Renaissance and touch on traditional expressions of popular music in later periods as well as “neoclassical” contemporary music. 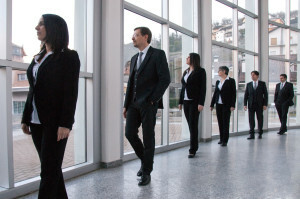 Their most important undertakings, in Italy and other countries, include an audition in 2009 for the X-FACTOR television programme where they were ranked among the top three group finalists, participation in the 49th International Choral Singing Competition and Festival “Seghizzi” in Gorizia (“The multi-prize winning quintet, The Blossomed Voice, presented the eclecticism of an ensemble that selects pieces from the sixteenth and twentieth centuries, strong […] in the great vocal blend of the group…The ensemble provided the ever rarer opportunity to listen to five-part performances of Renaissance works at an amateur competition, which afforded them the victory with a programme of great classics of the genre”, from the “Choraliter” journal), a concert at the 8th and 16th International “Seghizzinregione” Choir Festival, a performance at the Teatro Rex in Giarre (CT) during the international concert series “Incontro con la Polifonia”, a holiday concert at the Galleria Subalpina in Turin during the International series of Christmas choral concerts “Torino coi Fiocchi”, waiting the Europa Cantat Festival 2012, songs from their new CD were performed on the “Piazza Verdi” programme presented by the music critic and journalist Gaia Varon on RAI Radio 3, participation in the “AlpenChor Festival Oberwallis 2012″ in Brig (Upper Valais) Switzerland (see the review in “Voglia di Coro” ); the 8th Concorso Nazionale di Canto Corale “CITTA’ DI BIELLA” in Biella, a performance at the twenty-second edition and the twenty-five edition of the Festival Internazionale Massimo Amfiteatrof in Levanto (SP), a performance in the Baroque church of San Giorgio during the “ControFestival of the Settimane Barocche di Brescia – 9th Festival Internazionale di Musica Antica” (see the review in “Brescia Oggi” of CD and Concert ), the Masterclass held at the Scuola di Musica “Dedalo” in Novara by Maestro Stephen Connolly, the long-time bass singer in the celebrated English sextet, “The King’s Singers”. participation in the seventh season of the Festival “Aubes Musicales” concert at dawn to greet the sun at the Bains des Pâquis Geneva (CH), a performance at the “Terre di Maremma Classica – Jazz Festival” 2015 in Grosseto, participation in the Milano EXPO 2015 in San Maurizio al Monastero Maggiore of Milan, the closing concert of the 20th and 22th editions of the Festival “The Musical Vespers” in Santa Maria del Carmine in Brescia (see the review in “Giornale di Brescia”, by Fulvia Conter, Professor of History of Music at the Conservatory “Luca Marenzio” in Brescia, and see the 2nd review by Fulvia Conter, in “Giornale di Brescia”), at the 4th International Music Festival “Recondite Armonie” in Magliano In Toscana (GR), at MiTo SettembreMusica 2017 performing at the Basilica of Superga in Turin, at the 8th Concorso Nazionale Corale Polifonico del Lago Maggiore, at the 14th edition of the Lombard festival “I Venerdì di Maggio“, at the 4th edition of Festival Internazionale “Trame Sonore” in Mantua singing in Sala di Manto in Palazzo Ducale, in the sixteenth century house Casa del Pittore, and in Basilica Palatina di Santa Barbara, at the 57th International Choral Singing Competition and Festival “Seghizzi” in Gorizia (for the reviews look at the official site of Seghizzi www.seghizzi.it), at the 2018/2019 concert season of the Stefano Tempia Choir Academy performing in the Gran Madre church in Turin. The group has taken part in numerous concerts for charitable causes such as the events organised to benefit Ethiopia, Abruzzo, Liguria, Gruppo Emergency Ossola, AISM (Associazione Italiana Sclerosi Multipla), Associazione italiana F.O.P. (Fibrodisplasia Ossificante Progressiva), and for “Ciudad de los Ninõs di Cochabamba” in Bolivia. The Ensemble has also registered in 2017 the official jingle of the Medicus Mundi Italia Onlus ONG Association, written and donated by Maestro Azio Corghi (see the video). In February 2011, the group presented their first CD, “Madrigali, Balletti e Villotte: Viaggio tra le corti europee del XVI-XVII secolo”, which was devoted to secular Renaissance music (“They are a vocal group with a level of interpretive perfection that allows them to take on any style, from Renaissance to contemporary. 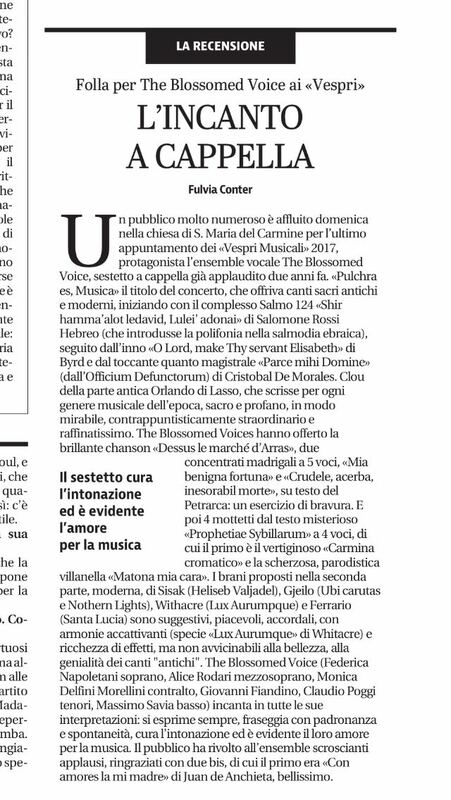 As an expert I can say that they would cut a fine figure in any important international concert“, by Maestro Fabio Vacchi in the local “Il Popolo dell’Ossola”; a more detailed review of the CD was published in “Voglia di Coro” ). In September 2015 the ensemble presents its second CD titled “A Better Day”, flavor profane, music from 1500 to Pop music of the 60s and 70s of the matrix above all American, with a fitting tribute to 50 years from the first (and only) Beatles toured in Italy. Enthusiastic reviews and significant acclaim have been accorded by Maestro Alessandro Palmeri (an accomplished internationally-known cellist), Hasruedi Kaempfen (musician, teacher and choir director in Switzerland and judge at the “Seghizzi” competition in 2010), Carlo Pavese (director of the “I Piccoli Cantori di Torino” and founder of the “Torino Vocalensemble”, and accomplished composer), Umberto Benedetti Michelangeli (nephew of the famous pianist Arturo Benedetti Michelangeli and internationally known orchestra conductor), Fabio Vacchi (contemporary composer of international fame and author of soundtracks for the film director Ermanno Olmi), Mauro Chiocci (director of the “Madrigalisti di Perugia” and member of the Artistic Commission at “Seghizzi” in 2010), Adriano Cirillo (celebrated pianist, teacher at the Conservatorio “G. Frescobaldi” in Ferrara and member of the Artistic Commission at “Seghizzi” in 2010), Ivo Antognini (composer, teacher and jazz pianist working mainly in Switzerland), Pietro Ferrario (conductor of the vocal ensemble “Calycanthus”, famous pianist, composer and organist in Italy and abroad), Jae-Joon Lee (director of the “Pilgrim Mission Choir”, the South Korean group who won the Grand Prix “Seghizzi” 2010 – 3° Trofeo delle Nazioni), the very famous English vocal group “Hilliard Ensemble”, Sante Fornasier (President of Feniarco), Giorgio Mezzanotte (accomplished international orchestra director), Emanuele Beschi (violinist, artistic director and President of the “Festival Internazionale di Musica Antica Settimane Barocche di Brescia”, he was teacher at the Conservatorio “Giuseppe Verdi” in Milan and Director of the Istituto Superiore di Studi Musicali “Gaetano Donizeti” in Bergamo), Gilberto Serembe (orchestra conductor and former teacher at the Conservatorio “Luca Marenzio” in Brescia and teacher at the “Italian Conducting Academy” in Milan), Fulvia Conter (professor of History of Music at the Conservatorio “Luca Marenzio” in Brescia), the Jury of the 8th Concorso Nazionale Corale Polifonico del Lago Maggiore, composed by Luigi Leo, Luigi Marzola, Roberta Paraninfo, Carlo Pavese e Gary Graden, Luca Scaccabarozzi (director of Ensemble Vocale Mousikè and Torino Vocalensemble), Marco Berrini (director of Vocalia Consort in Roma), Dario Tabbia (teacher and director of Coro da Camera di Torino), Oreste Bossini (music journalist and radio host for RAI Radio 3), Carlo Fabiano (artistic director of the International “Trame Sonore” festival in Mantua and first violin of the Mantua Chamber Orchestra) the Jury and the Artistic Commission of the 57th “Seghizzi” International Choir Competition in Gorizia, composed by Maestri Budi Susanto Yohanes (Indonesia), Denis Ceausov (Moldavia), Eugeniusz Kus (Polonia), Božidar Crnjanski (Serbia), Dariusz Dyczewski (Polonia), Pietro Ferrario (Italia), Carl Hogset (Norvegia), Marko Munih (Slovenia), Ramiro Reall (Spagna), Alexei Shamritski (Ucraina), and Toth Marton (Ungheria). CERTIFICATE AS FINALISTS of the 22nd GRAND PRIX – Trophy of Nations. SECOND PRIZE in the section for Solo and Ensemble Vocal Groups. 1° ABSOLUTE AWARD to the GRAN PREMIO DEL LAGO MAGGIORE. THIRD PRIZE at the 30th GRAND PRIX – TROPHY OF THE NATIONS. The vocal ensemble was born in January 2008. The repertoire covers a historical period that ranges from Renaissance sacred, secular polyphony to jazz and pop arrangements of the twentieth century and "neoclassical" contemporary music.